Win a Set of Chicken Racing Saddles! Were your chickens inspired by the Olympics? If they’ve been showing signs of competitive dustbathing or if you think there’s a potential Jessica Hennis in your flock, you’re going to love this week’s competition prize – a set of six chicken racing saddles! 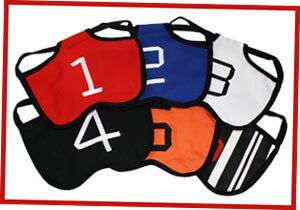 In the same colours as greyhound racing jackets, these slip-on saddles have numbers one to six stiched on, so you can easily identify each olympeck hen. Set up a course in the garden, leave some mealworms at the finish line and have a cheeky bet on which chicken will get gold. To win this set of racing saddles you must have six chickens. Send us a photo, their names and tell us what they would eat to prepare for a race. Send to stephanie@omlet.co.uk by Friday 31st August. This month nature blogger Welly Woman was lucky enough to be invited to tv presenter Kate Humble’s home, to discover beekeeping. Beehaus owner and wildlife enthusiast Kate bought a farm with her husband to create a rural skills centre, which now runs a range of courses for the public. Welly woman trialled the ‘Sustainable Beekeeping’ course, and she had a bee-rilliant day learning about bees. Run by Monica and Nicola from Bees for Development, the course included learning the science behind bees, inspecting a beehive, honey tasting and a visit to Kate’s own beehives, including the Beehaus. Lots of tasty treats were included in the day, such as homemade honey biscuits, and the course was in an area of outstanding natural beauty, with only sounds of birds, bees and sheep to be ‘herd’. Educational and enjoyable, it all sounds rather wonderful doesn’t it!? And you could win a day there for yourself! Welly Woman has one day at Humble by Nature to give away, and it’s easy to enter. Just subscribe to her blog and make a comment by this Monday, 27th August. Easy beesy! 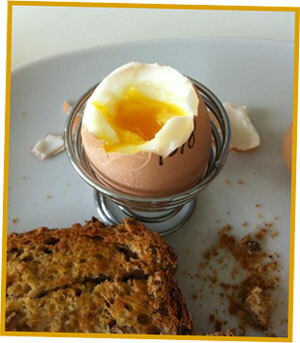 Enjoying a breakfast like this each day is one of the many joys of keeping chickens.